Teachers receive a free guided tour of the exhibit before bringing their classes. Parking for school buses is free. Buses should come in through the secondary gate next to the entrance to Universidad Galileo. Security guards there will be advised of your school’s visit and will tell the bus driver where to park. Vehicles using this entrance do not need to get a parking ticket. 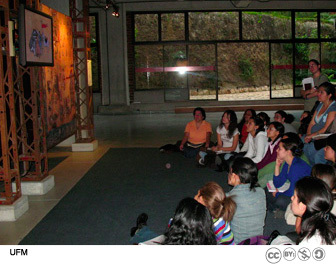 This is an educational cultural visit and the same rules that apply in the classroom apply here. Please review the following list with your students before your field trip; this will help ensure all of the students in your group get the most out of their visit. Cell phones should be turned off. No talking so you can hear the guides and the video. Sit on the bench or on the carpet in order to see and hear the video. Leave lunchboxes, backpacks, and other large items in the indicated area where security guards can keep an eye on them. Visit the restroom before and after the visit so as to not disturb others. Do not touch the screens or lean against the walls or columns. Be considerate of other visitors to the exhibition who may not be part of your group.